The Texas governor didn't exactly score a home run when it came to arguing his point. 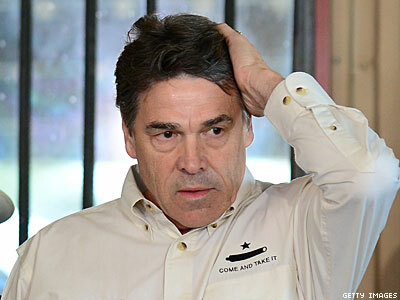 Texas governor Rick Perry was more nonsensical than usual while speaking on the Family Research Council's "Stand With Scouts Sunday" program, bringing pop culture and slavery into a discussion on the Boy Scouts' ban on out scouts and leaders. Perry said that the Scouts should not be swayed by "pop culture" to allow openly gay scouts or troop leaders (the organization may soon allow the former). He also began rambling about how former Texas governor Sam Houston opposed slavery and it cost him his governorship. "That's the type of principled leadership, that's the type of courage that I hope people across this country on this issue of scouts and keeping the Boy Scouts, the organization it is today," Perry said, "because it is serving young men and women and if we change and become more like pop culture young men will not be as well-served, America will not be as well-served, the Boy Scouts will start on a decline that I don't think will serve this country well as we go into the future." Read more here and watch the video below.